How many of you in the reading audience have ever seen the end of the rainbow? The answer might be none. Rainbows are seen spanning the skies, but according to some reports, nobody has seen the bottom end of a rainbow. This is the information I received from a reader who stopped by the house the other day and handed me an envelope. What was in the 10×12 envelope? 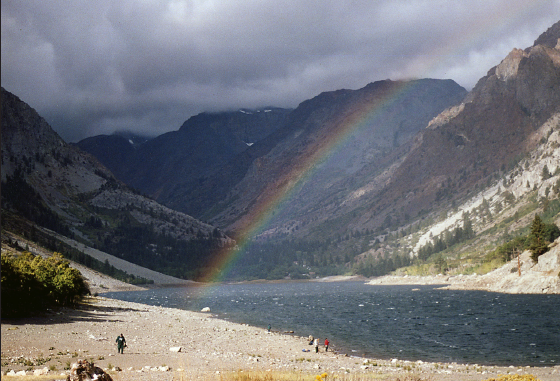 A photo showing the end of a rainbow touching a lake — and he took it. If it is true that the end of a rainbow has never been seen and he has a photo, I decided, why not print it in my column? The gentleman who took the photo said he captured the end of the rainbow in the mountains surrounding the State of Washington. It’s a beautiful photo taken in color. Unfortunately, my column is printed in black and white, so some of the charm of the rainbow is lost. Thanks to the reader for providing me with the photo. Well, most aging Nisei have two names. One is, of course, English, the other Japanese. I’m not sure why, but my Issei parents didn’t go with the trend to give their offspring an English name and a Japanese name. My parents named their oldest child, my sister, Shizuko, and that was that. My brother, the second-oldest, was named Sueki. Following was the second daughter, who was named Kazuko, and the third, Mieko. After that, my parents changed direction completely. The sister above me was tagged Mary, no Japanese name. And I followed with George, no Japanese name. It was never explained why my Issei parents went from Japanese names to English-only names for my sister and me. When I said I didn’t have a Japanese name, no one believed me and that’s how I went through life. My sister often told me he same story about her being asked what her Japanese name was. When she responded, nobody took her seriously. “How can you not have a Japanese name?” she was always asked. Of course, I ended being called “Horse” or “Uma,” so that’s my Japanese name. My wife and I gave our first child the Japanese name Ichiro, which translated into English is “First.” Our second, who passed away last year, had a Japanese name, Niro. Our third was born in Japan, so we named him Tokio. Our fourth ended up with the Japanese moniker Yoshio. They rarely use their Japanese names. Although from time to time, they asked why we gave them Japanese names, especially since I didn’t have a Japanese name. Well, their mother has a Japanese name, I tell them. They weren’t aware of it. Now they know their mother, Susie, is also Yoshiko. Yeah, our sons know about their Japanese names because they all have passports since we lived in Japan. Passport agents used their Japanese names as frequently as their English names. Oh well, enuff of this chatter. I was dialing Gwen on her cell phone to tell her that if she picks up my column, there would only be three pages vs. my usual seven pages. I was able to hang up before she picked up her phone because, as usual, my son the computer expert dropped by. No, I didn’t call him. He drops by frequently because he knows I have problems due to my lack of knowledge of how to correct the danged thing when it goes haywire. So, here I am, thanks to my son Mark. I kind of find it hard to believe, but stories in various newspapers around the country are predicting the demise of thoroughbred horse racing in the U.S. in the near future. Yeah, I know that horse racing isn’t as popular as it used to be, but the sport vanishing? I know I don’t get out to the track anymore. For one reason, they closed live racing in Hollywood Park, which is only 10 minutes from Gardena, and Santa Anita is about a 40-minute drive. On top of it all, for a JA race-goer, there aren’t any more JA jockeys. Yes, Corey Nakatani is still riding, but he doesn’t get too many mounts on the card. Usually one or two. I don’t know if the absence of JA jockeys is the reason, but you don’t find too many (if any) JA racing fans at the tracks. In the old days, if I wanted to meet some of my JA fiends, I didn’t have to go to Little Tokyo. The race track was the place to run into them. A lot of them (if they are like me) are aging, so they may find it tough to work a trip to the track into their schedule. I am curious why some of the younger JAs haven’t given some thought to becoming jockeys. Remember when we had as many as three JA jockeys on one card at Hollypark and Santa Anita? Maybe our Sansei and Yonsei are no longer jockey size. These days, JA youths are football- and basketball-size athletes. A little change of pace. According to a news release from Supervisor Mike Antonovich’s office, efforts to entice Japanese and Chinese businesses to Los Angeles County and California will vanish because there is a “steer clear of California” movement in the two countries. Maybe the foregoing topic isn’t of interest to my readers, so I’ll just cut it off instead of filling more space with the issue, now a hot topic in government circles. Hey, with winter almost upon us, those going on vacation will probably consider going to our Island neighbors, Hawaii. If you are among them, here’s a bit of advice. If you are going to Maui, going surfing and diving at this time of the year can be a bit hazardous. A number of Mainland tourists, including a woman from Southern California, had to be rescued from the tides, which nearly drowned her. While going swimming off the beach in Maui seems like a thing to enjoy, tourists not familiar with the tidal movements are involved in life-endangering situations. Just thought I’d toss this in for potential Maui tourists. Well, perhaps it’s time to catch up on local happenings. One of them is the election, which is just a few weeks away. 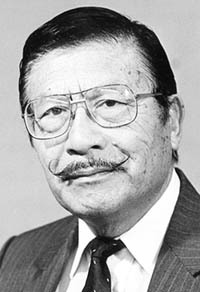 I mentioned in a recent column that I haven’t seen Paul Tanaka, a candidate for L.A. County sheriff, for some time, and didn’t know if Paul read my column. But lo and behold, he dropped in at our house the other day, so now I can put a few lines about our getting together. He seems confident in his bid to become the next sheriff, and why not? He was with the Sheriff’s Department for over 30 years. That’s five years more than my writing for The Rafu. Heh, heh. I can’t predict how the election will turn out, but one thing for sure. He’ll have six votes from our household, and maybe I can tell our neighbors to cast their vote in his favor. My neighbor across the street came over the day of Paul’s visit to our house, but he didn’t mention anything about Paul’s running for sheriff. Instead he said, “Was that the mayor who just left your house? Gee, maybe I’d better jump on my horse and talk to a few more people like my neighbor. Hey, in an election, every vote counts. Regarding the other JA candidate in the next election, Al Muratsuchi for Assembly, I haven’t had any contact with him or his campaign people. Maybe he’s never seen my column. Oh well, we’ll know next month how things turn out. Yeah, I’ve been having some medical problems and I’ve spent a little more time with my medical people. Hopefully, I can gear up to my usual pace next week. Hey, when one reaches my age, medical problems become unavoidable. But there are a lot of things popping up in the near future, so hang in there with me and I’ll get going on them, especially the coming election, which I will touch on more. See ya. Thanks for tuning in, and also thanks to Gwen for dropping by our house twice a week.